KBB.com Best Buy Awards Finalist. Scores 24 Highway MPG and 17 City MPG! This Ford Explorer boasts a ENG: 3.5L TI-VCT V6 engine powering this Automatic transmission. DUAL-HEADREST DVD ENTERTAINMENT SYSTEM -inc: Pre-installed, Wheels: 20/ Premium Painted Aluminum, Voice Activated Dual Zone Front Automatic Air Conditioning. 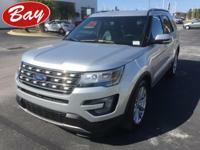 *This Ford Explorer Comes Equipped with These Options *Valet Function, Trunk/Hatch Auto-Latch, Trip Computer, Transmission: 6-Speed SelectShift Automatic, Towing Equipment -inc: Trailer Sway Control, Tires: P255/50R20 AS BSW, Tire Specific Low Tire Pressure Warning, Tailgate/Rear Door Lock Included w/Power Door Locks, Systems Monitor, SYNC w/MyFord Touch -inc: voice-activated communications and entertainment system w/911 Assist, Vehicle Health Report (VHR), 8/ LCD color touchscreen in center stack, (2) driver configurable 4.2/ color LCD displays in instrument cluster, (1) smart-charging multimedia USB port, (1) powerpoint in media hub, SD card reader is provided complimentary (traffic reports, GPS based turn-by-turn directions and information services). * This Ford Explorer is a Superstar! *KBB.com Best Buy Awards Finalist, KBB.com 5-Year Cost to Own Awards, KBB.com Brand Image Awards. 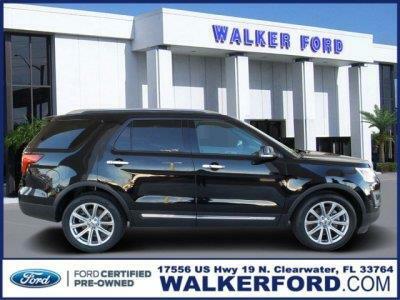 * Visit Us Today *Come in for a quick visit at Walker Ford, 17556 US 19 N, Clearwater, FL 33764 to claim your Ford Explorer! Walker IS Ford! Invoice Pricing? Employee Pricing? Tired of the gimmicks? Get the lowest price, the best customer service and HUGE selection every time at Walker Ford. Stop in today, we are conveniently located off US 19 in Clearwater, view the map for direction, and don't forget to check out our 5 star reviews while you're at it!